Sources: U.S Energy Information Administration, based on Baker Hughes and HPDI, LLC. 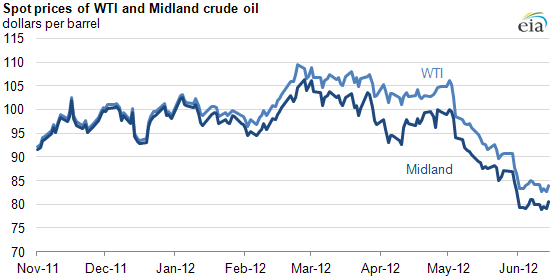 Notes: Graph includes rig counts through June 2012 and oil production through December 2011. Active rigs include rigs drilling for both crude oil and natural gas. The source for the crude oil production data series published on July 10 was websites of the Railroad Commission of Texas and the New Mexico Energy, Minerals and Natural Resources Department. On July 11 the source was changed to HPDI, LLC, because HPDI, LLC collects both that data and production data that has not yet been processed by the Railroad Commission of Texas. The Permian Basin—a long-time oil and natural gas producing region in west Texas and eastern New Mexico—is showing signs of new life. 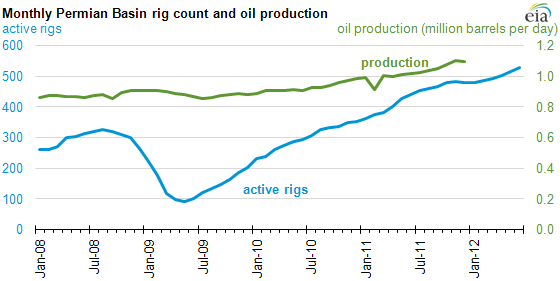 The active rig count has grown from 100 rigs in mid-2009 to over 500 rigs in May 2012. According to data from HPDI, oil production from the Permian has increased fairly steadily over the past few years, reaching the 1 million barrels per day (bbl/d) threshold in 2011—the first time since 1998. Sources: U.S. Energy Information Administration, based on Bloomberg. Growing oil production in the Permian Basin and other Texas plays, most notably the Eagle Ford shale, may be starting to strain existing takeaway capacity and is creating a need for Texas oil to serve more distant refineries. While new pipeline projects are scheduled to come online, current transportation constraints have caused Permian crude oil, which is priced in Midland, Texas, to sell at a significant discount to WTI beginning in January 2012.